Avilanis (Avi) is a half-elf rogue, born to an elven father and a human mother. Following her mother's death Avi fell in with a group of pickpockets. She now finds herself on the run from some dwarves, who were apparently upset about their belongings no longer belonging to them. But in Avi's defense, they were super obnoxious dwarves. Idirmil (Idi) is a human fighter, who joined the local army in their teens. After being wounded in battle their career as a soldier was effectively over, and they eventually became a sellsword for local merchant caravans. Despite appearances, Idi can be quite jovial, especially around a campfire with a deck of cards, mead, and music. 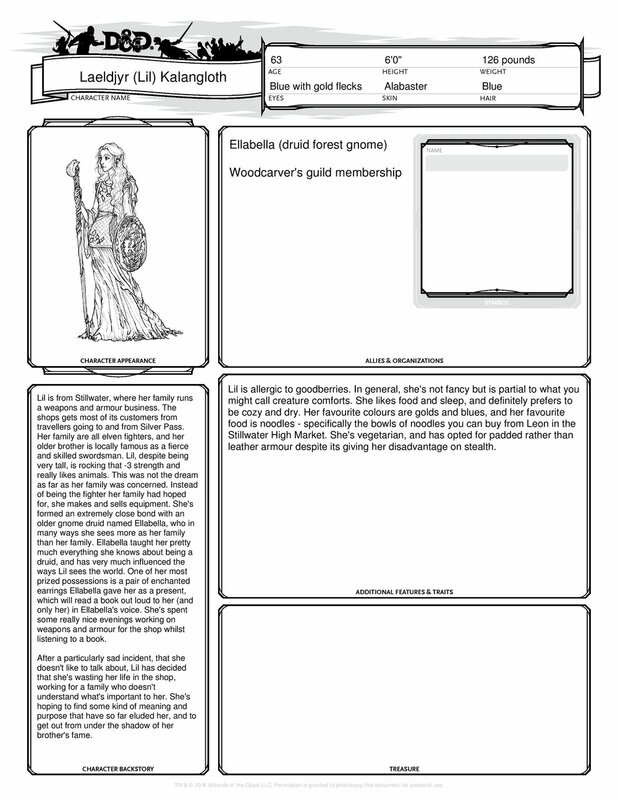 Laeldjyr (Lil) is a blue-haired moon elf druid, who comes from a very disappointed family of elven fighters. Despite her family's best hopes for her, she is far too slight for combat, as indeed she is far too slight for strong winds. She trained as a woodcarver, but has gone out into the world seeking meaning, adventure, and hedgehogs. T'Chad Noeliam T'armak is a tiefling bard, who boasts the unusual distinction of being a favored son of a lute cult. He has been sent on an evangelical mission to spread the nominally good word, though he lacks experience of pretty much everything. He can usually make up for it with charm; strong emphasis on usually.